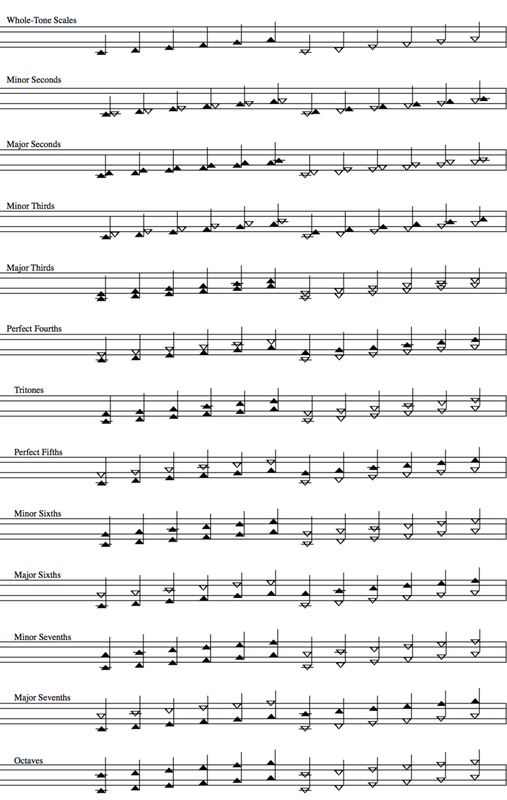 TwinNote Music Notation by Paul Morris was designed in December of 2009 when it was first introduced on this wiki page. For more complete documentation of TwinNote, see the TwinNote Music Notation website and also this page on the Music Notation Project’s website. TwinNote was inspired and influenced by Twinline notation in its various versions by de Vries, Reed, and Keislar (as well as Bilinear notation by Sotorrio). When compared to Black-Oval Twinline (Morris’ version of Twinline and previous notation system of choice), TwinNote is simpler, using two note shapes, triangles pointing either up or down. The two orientations of the triangles highlight the 6-6 pitch pattern. In one whole tone scale all the triangles point upwards, and in the other they all point downwards. In a chromatic scale there is a regularly alternating pattern of triangles pointing upward and downward. This way of representing a 6-6 pitch pattern gives intervals a more clear and consistent appearance (than is found in Black-Oval Twinline notation, for example). Below is a chromatic scale with alternating solid and hollow noteheads. This was the original note layout, but it is no longer accurate. In March 2011 Morris shifted the notes up a semitone so that the notes C D E F G A B would correspond to the lines and spaces of the traditional treble clef staff. The images below show the previous note assignments (with only C D E corresponding with the treble staff). Chromatic scale with original note layout (no longer accurate). In the image above the centers of the triangles are shown at 3/8 of the triangle’s height (the distance from its base to its tip). In geometry there are various kinds of centers for any given triangle, for example: Incenter, Circumcenter, Centroid, and Orthocenter. The most relevant center in this case is arguably the centroid, also known as the triangle’s “center of gravity”. For an isosceles triangle like the ones used in TwinNote, the centroid is located at 1/3 (0.333…) of the triangle’s height. (Interestingly enough, changing the width of an isosceles triangle does not affect the centroid’s position on the vertical axis.) 1/3 of the height is only slightly less than the 3/8 (0.375) shown in the image above. To find the difference: 0.375 minus 0.333… equals 0.041666… of the height of the triangle. The triangle’s height is the same as the distance between two staff lines which are commonly spaced about 1/16 (0.0625) of an inch apart. So 0.0416 times 0.0625 is only 0.0026 of an inch in terms of actual real-world difference between the centroid and the 3/8 point. The following image illustrates the difference between the centroid at 1/3 and the 3/8 point used in the image above. Even at this large magnification, the difference is quite small.